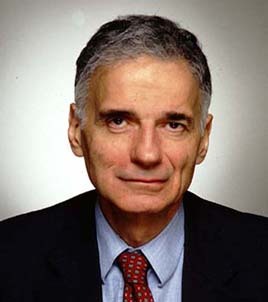 Because I said so: Ralph Nader accuses Barack of Pandering to White Guilt. Ralph Nader accuses Barack of Pandering to White Guilt. "Whether that will make any difference, I don't know. I haven't heard him have a strong crackdown on economic exploitation in the ghettos. Payday loans, predatory lending, asbestos, lead. What's keeping him from doing that? Is it because he wants to talk white? He doesn't want to appear like Jesse Jackson?" What, are the other two candidates sufficiently addressing the problems of the ghetto? Or should Obama take special interest above them because he is half African- American? Whatever! There has never been an overwhelming regard for the ghettos, barrios, or hick towns of America. Why because that’s not where the candidates receive their votes. Nader it is not were YOU will receive your votes. So shut it! Talk white, eh? So all this verbiage about talking white as just a myth perpetuated by the black community has now spread and been bought by white America. When did speaking proper English become solely designated to the use of white people alone? These are the type of statements whether used by Black people or White people that reek of bigoted, prehistoric ideas that continue to plague the consciousness of American minds. As far as White Guilt goes, I do not hold White people I encounter responsible for slavery. I hold people accountable for what they do now! Nader talks awfully big about the interests of African-Americans for someone who has been doing the work of the race-baiting Republicans the last few election cycles. Nader has never made any serious effort to reach out to African-Americans before, which is one of the reasons why the tiny and dwindling base of supporters that he has is almost exclusively white and upper/middle class. He's just a big attention whore, nothing more. big tex...luv...did you say "attention whore" OMG LMAO...okay seriously. Things are about to get really ugly around here with politics. Everyone that has tried to hold their peace and scream " I'm not racist, my bestfriend is black" can no longer sit. Obama has come too close so now the chaios is starting. I'm not like the biggest OBAMA fan in the world but I'm surely not voting for McCain. So there ya go! May the best man win! I'm afraid you're right - what we've seen thus far is just the tip of the iceberg. And voter suppression is going to be part of the chaos too - Dallas South has a post up about this now, and it's something I hope to talk about at length in my blog at some point in the near future. But I think Obama is up to the challenge, and I know that a lot of us are prepared to go to the wall for him. It won't be pretty, but it'll be worth it once we get him into the White House. Obama's certainly not perfect and he does have his flaws, but he's our best hope for the future. Parenthood is a ______________ ! Hip Hop Where did you GO?